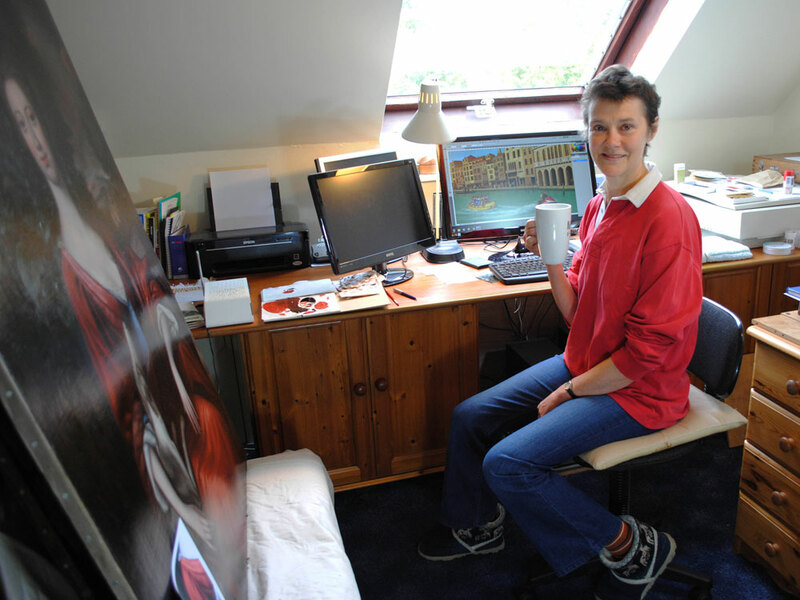 Anne Sharp meticulously works both in the traditional and digital format to produce her artworks. With her client list a diverse mix between publishers and advertising agencies, Anne works continuously with vivid details enticing you into her work. Carefully drawn, versatile, richly coloured. Inspiration tends to come most from the client’s brief itself – I love working out how best to provide what’s wanted, and ideas come from a staggeringly eclectic range of sources. The way light behaves constantly catches my eye, whatever it’s falling on, and I’m always looking for different aspects in other artists’ work, according to what a current project needs. At the moment I am gazing awe-struck at Van Dyck’s fabulous handling of 17th century clothing. One – Suddenly noticing the house is in a state. Two – Phone calls and emails breaking the flow. One – Longing to see if the next bit of the painting is going to work. Two – Never wanting to miss a deadline. Three – Wanting a pat on the head at the end, and payment! Two – Radio 4, and 4 Extra, and World service – with my overactive mind absorbed in an informative or diverting flow of words, my hand is free to paint in ways that can usefully surprise me. There are times when I don’t take in a single sentence, but the sound still helps. Three – A small, battered, rectangular mirror has been with me for years. I use it all the time to see work afresh – back to front, upside down and further away. Even with computer-generated imagery, it is quicker to hold up a mirror than reverse a huge file. How do you feel your personal work feeds into and influences your commissioned work? In a way my personal work IS my commissioned work – I get huge pleasure in interpreting a brief well and having a more-than-satisfied client, and knew as a child that that was how I wanted to paint. If you weren’t working as a freelance illustrator, what would you be doing? If I weren’t an illustrator, it is science that most attracts me. Human biology, and how our minds work, particularly mind-body interaction, placebo and individual subjectivity, all fascinate me. The Vodafone job, destined within various formats across Ireland, was a joy – even with its punishingly tight deadlines. The first brief involved a string of cartoon-ish sketches of various animals happily using different bits of kit to get them ahead of their fellows. All the drawings were funny and misleadingly simple – in conference calls with the [superb!] art direction team at Grey’s, it became clear that the first three animals chosen were to be seen not against a simple wall-and-skirting board or notional grass-sky background, but in detailed renderings of something like their usual habitats. All three made my newly upgraded computer crash frequently – the files were noticeably vaster than those I’d worked on before, with multitudes of layers and shoals of reference pictures. Even with each image broken into separate files for working on the background, the animal itself and the machinery it was using, saving was still a dauntingly slow process. Thank heavens for greater memory capacity now, though my way of working constantly asks a lot of the software. I loved the central theme for the whole campaign – there were two more animal posters to do later, and then a vast depiction of the Grand Canal in 18th century Venice, showing an enterprising gondolier hogging all the trade with his forward-thinking jet-ski. That one was particularly interesting when it came to making it work in every layout required, from standard portrait shape to one that was very, very wide and shallow, presumably to run along an airport corridor. As ever when sending artwork off, I thought it looked terrible, and was hugely relieved when the client was declared to be very happy with the work, and I could catch up on sleep!